In the last article, I was evoking this intuition I have about the best transgression of the wall being the fact of standing on it. Pretty stupidly, I did not recall immediately all those East and West Berliner on November 09th 1989 who exactly did that. 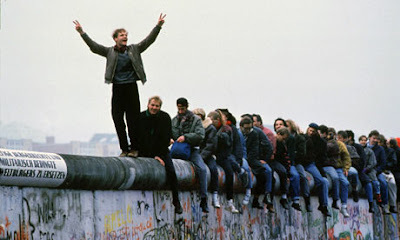 The gesture there was not so much of crossing the wall but rather standing freely on it, on the very narrow part of Berlin that belong to both East and West.